The Times New Roman: Booked! I'm excited that I found a hotel to stay at while I'm in Chicago for Lollapalooza! I had my fingers crossed in hopes that I would win a package for a hotel in Lincoln Park but I actually came in second place (something that is usually the case with me). Hotels in Chicago are always expensive but because Lollapalooza is such a huge weekend, the prices were even higher than normal and most of the rooms were already sold out. Fortunately, after playing around on Expedia and Travelocity, I found an unbelievable deal for a nice hotel that's just a few minutes south of Grant Park and directly on the Metra line; such a relief! I'm the type of traveler that doesn't care what hotel I stay at in terms of quality but location is important to me. You go on trips to see what's outside your room and it's just a place to sleep and shower, right? 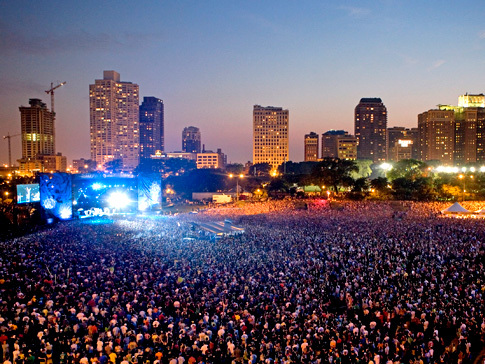 Since Lolla is a city festival, I really wanted to be close to bars, restaurants and nightlife. I definitely lucked out in finding a place that is affordable, close to the action and actually reputable. My Top 10 Favorite Songs of ALL TIME?!? !